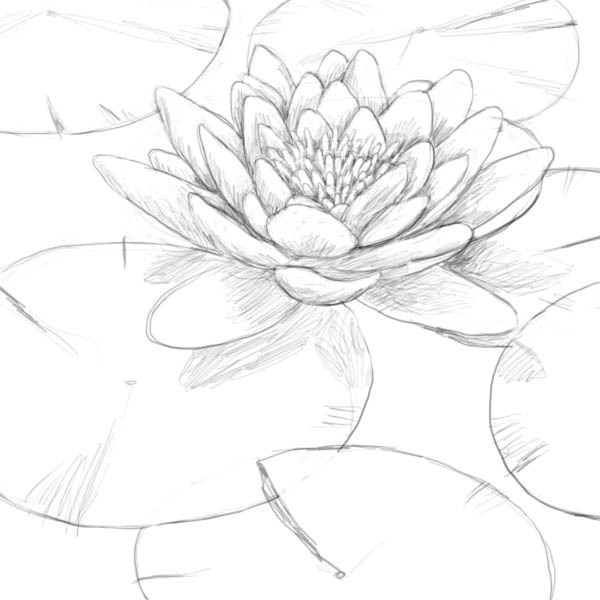 Learn how to draw a beautiful lily pad flower in pencil using our simple step by step tutorial! 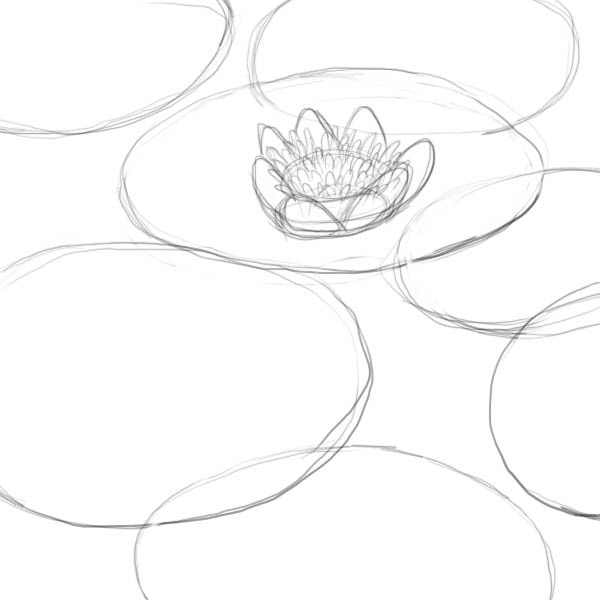 Welcome to How to draw a Lily Pad. 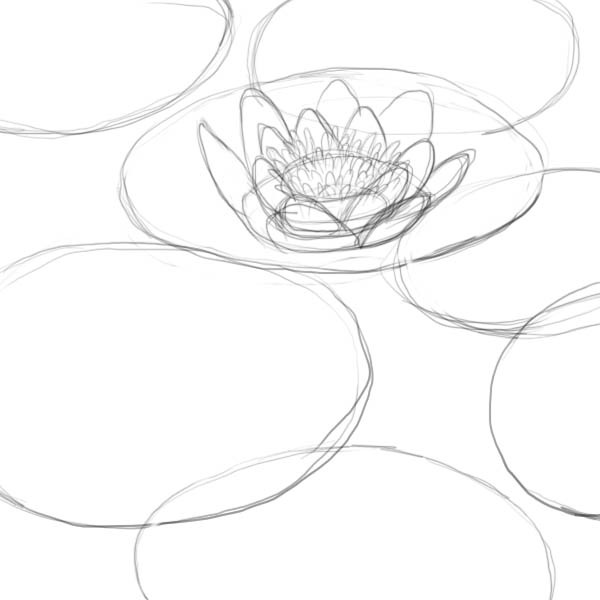 – In this tutorial we’ll learn a procedure to draw a beautiful flower, a Lily. 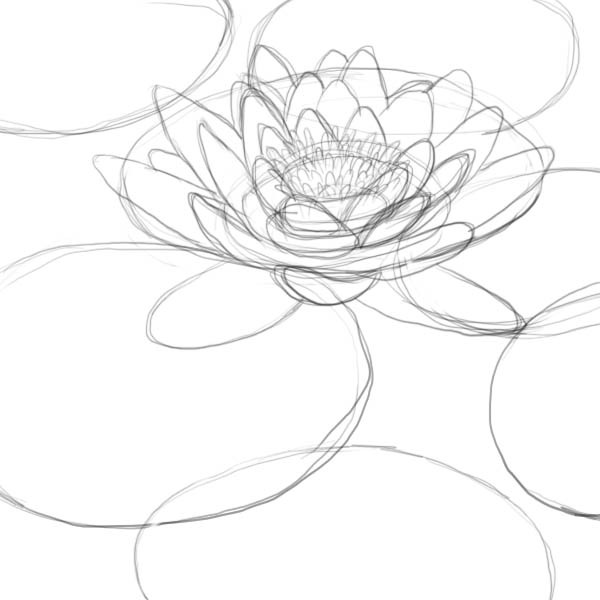 This flowers may seem hard to draw due to the high number of petals and the complicate tri dimensional structure. However they are not hard to draw using the right approach which is drawing them starting from the center and carefully adding rows of petals. Nymphaeaceae is a name for a family of flowering plants. Members of this family are commonly called water lilies and live in freshwater areas in temperate and tropical climates around the world. There are about 70 species of water lilies around the world. Water lilies are rooted in soil in bodies of water, with leaves and flowers floating on the water surface. The leaves are round. Water lilies are divided into two main categories: hardy and tropical. Hardy water lilies bloom only during the day, but tropical water lilies can bloom either during the day or at night, and are the only group to contain blue-flowered plants. 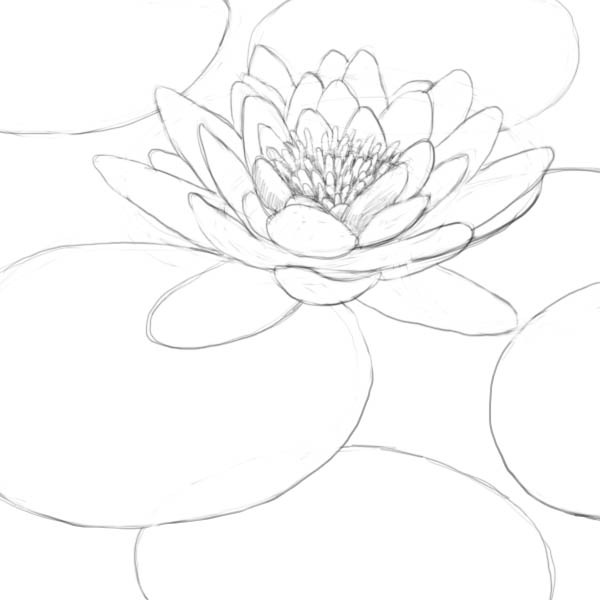 How to draw a Lily Pad – Let’s get started! Let’s start by drawing circles, these represent the big circular lily leaves floating on the surface of a pond for example. 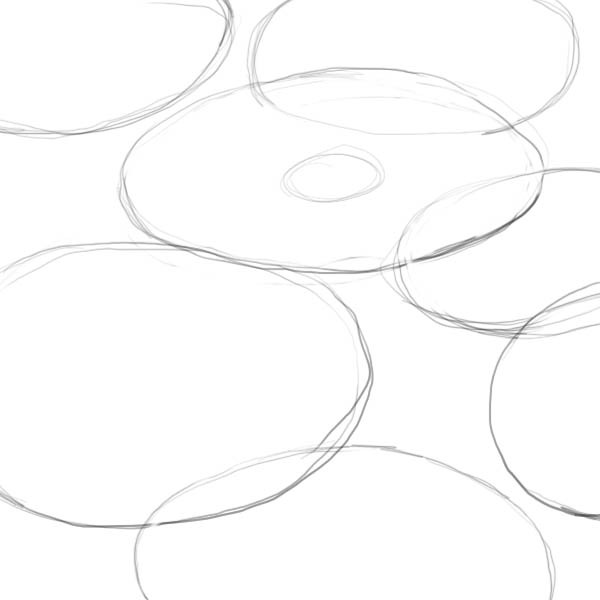 Now choose one of these circles and draw a small circle inside. From this little circle draw many little stems emerging. Draw them as they were emerging from the center of the leaf. 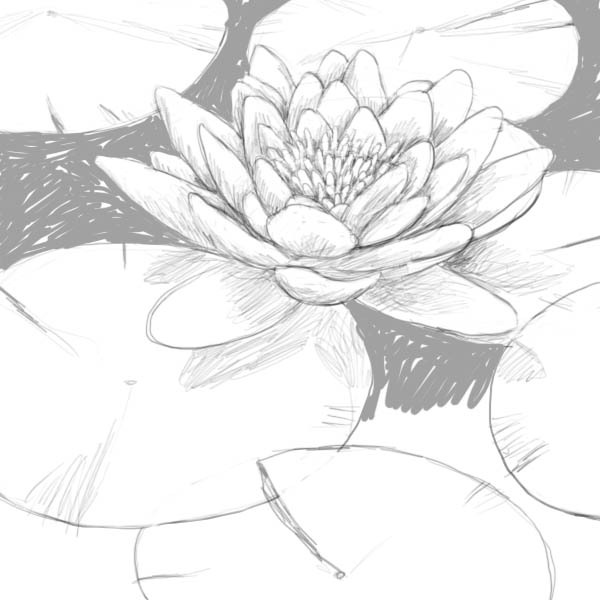 From now on you’ll need to draw the lily petals. 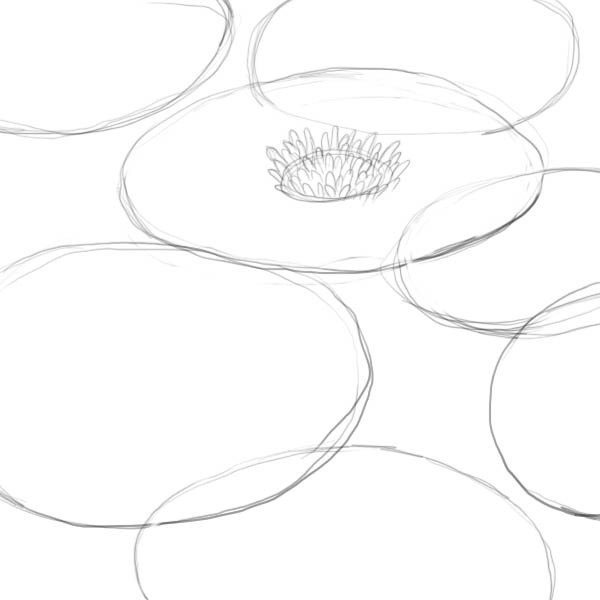 Start from the perimeter of the small circle and add a first crown of small petals. Keep in mind that in this view the front petals are coming toward the observer and as such they look shorter and compress. Once you have finished the first crown of petals move to the second crown of petals emerging right at the base of the first crown. Go on with adding petals concentrically and add at least other two or three crowns of petals to complete the flower. When drawing the petals of different crowns remember that they alternate in position from one crown to the other. In other words they are not aligned and each crown is rotated 45 degrees from the previous and the subsequent. 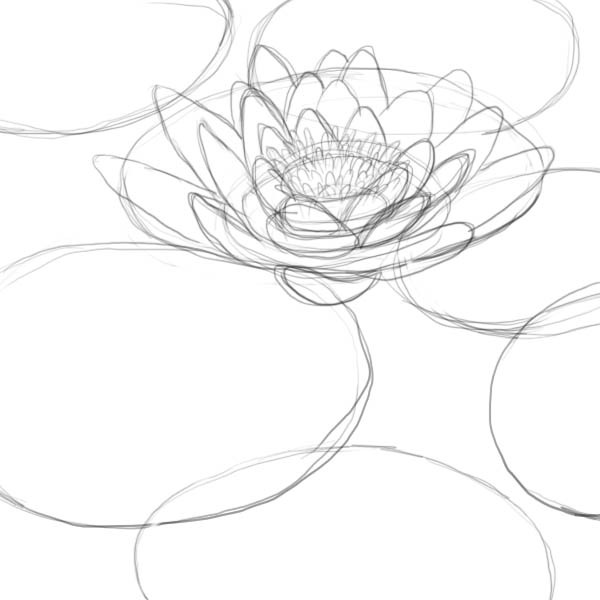 Finally add the four big petals at the base of the main flower. These petals lay almost flat on the water surface. Now you really need to clean Your drawing and give tri-dimensionality to the composition. In order to do that remove all the construction lines and carefully separate each petal using a softer pencil and a bit of shadow. Do not overdue with the shadows, keep them light and use them just to emphasize the position of petals against each other. The final touch to the drawing can be lightly filling the water surface with a soft pencil to make the flower stand out even more! 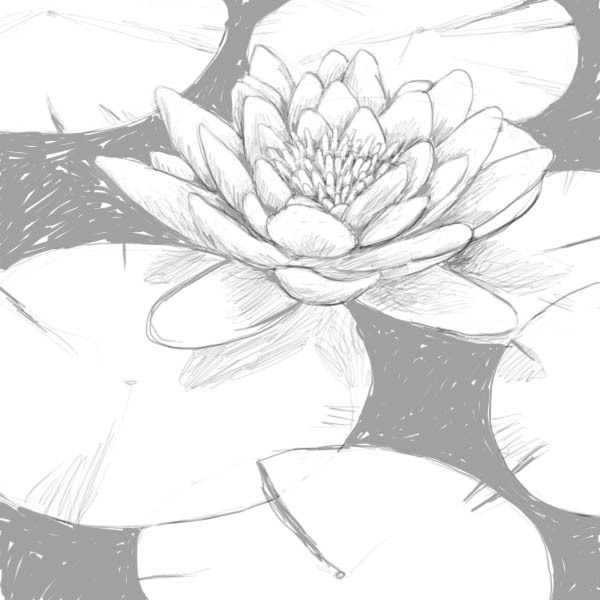 How to draw a Lily Pad – The finished result! And You did it! With the help of Drawing Factory of course! You have realized a beautiful drawing of a Lilly pad!